Can I inspect the container? What condition are the used containers in? Used containers are generally released from shipping lines for resale after they have been written down on their books for about ten years. So a container straight out of shipping will likely be at least ten years old. Expect a few exterior dints and/or patches (they have been around the world a few times don’t forget). We also offer refurbished containers which have had the interior floor sanded and painted. What condition are the doors in? Do they work? Every container is checked in our workshop prior to release. The door gaskets and locking mechanisms are inspected to ensure they are all in good working order. Do they have timber floors or steel? Most floors are marine timber ply but there are also some with steel floors. The most common are blue or brown however we do offer a repainting service in which your container can be custom painted to a colour of your choice. We keep 10ft, 20ft and 40ft General Purpose and High Cube containers in stock. Refer to our sales page for more information. What are the dimensions of a shipping container? **This chart is a guide only. As the containers are manufactured they may vary by a few millimetres. Please note 10ft containers created using the cut down process are not suitable for international shipping use. What is the difference between a standard and a high cube shipping container? The difference is the height of exactly one foot, giving it extra storage capacity. Payment is required prior to delivery. We accept payments via direct deposit (EFT), Cheque, Cash, Bankcard, Mastercard, Visa and American Express cards. Will you buy the container back once I’ve finished with it? Yes we do, however bear in mind when we quote a buy-back price that we have to consider transport costs and the amount of time the container will be in storage with us before we can resell it. We can arrange same day delivery to most Melbourne suburbs. Delivery time depends on available transport, the required container and quantity and if any accessories or modifications are required. Delivery is usually booked at the time of your order. Yes, we deliver all over Victoria. Some of our transport partners are based in Geelong and Ballarat and we deliver on a daily basis. When placing your order we will discuss which type of truck will be best suited for your needs. Most commonly we’ll use tilt tray and side loaders. A tilt tray truck reverses to the delivery point and the tray will tilt to the ground with the container sliding off the back A side loader lifts the container off the driver’s side and place 1 metre beside the trucks trailer. 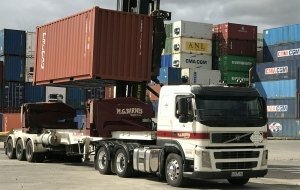 Can I get the container into position where I want it so I don’t need a crane? Yes absolutely you can, but you need to make a Containerchain booking. Also for safety reasons all transport vehicles must have twist lock mechanisms as we do not allow operators to climb on top of the container. Do the containers need to be supported when placed down or can they go straight on the ground? Its best to ensure that your container is on a level surface as uneven ground may impede on the operation of the doors. The container can sit directly on the ground with only the four corners being in contact with the surface. Generally no surface preparation is required however elevation is recommended to prolong the life of the timber floor by creating air flow underneath the container. Many of our customers choose to place sleepers, timber or bricks under each corner end. Yes, they can! Just ask one our friendly staff team members and have your plans ready. How much do you charge for modifications? Prices will depend on what your specific requirements are so it’s best to contact our sales team for a definite quote. In Victoria, storage sheds do not require a permit or approval if they meet the following guidelines. A 10ft shipping container thereby does not require a permit. For other sizes we suggest you contact your local Council and check their individual requirements as each one is different. Want to contact your Council?